Wong En Li or better known as Ellie, hails from Ipoh, Perak Darul Ridzuan. 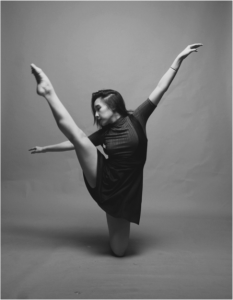 Her journey in dance began at the age of five when her parents enrolled her into a ballet school. Her enthusiasm and love for dancing grew and upon completing her studies, she decided to enroll in the National Academy of Arts, Culture and Heritage (ASWARA). There, she obtained her Bachelor of Dance (hons), majoring in Contemporary Performance. In her time at ASWARA, she studied a variety of dance genres including Malay Traditional, Chinese Folk Dance, Bharathanatyam and Contemporary Dance. Ellie has shown great versatility by engaging herself in a wide range of productions such as Gelombang Baru, Jamu, Tapestry, Short & Sweet Dance Festival, Kuala Lumpur International Drums and Dance Festival (Genta), Aduh Serojah and Main Zapin. She also participated in the Thailand Dance Festival, Songkhla in year 2016 to gain some international exposure and experience.